Our forth giveaway has been provided to us by the lovely company Bunches. We have recently had the pleasure of reviewing a beautiful bouquet from them. Our prize today is the Dasher's Delight Christmas bouquet which would make a brilliant present for all your loved ones. 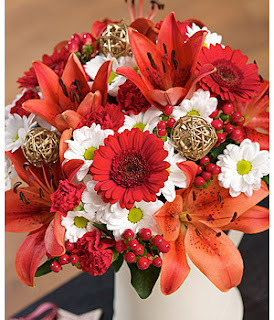 Surprise a loved one this Christmas with a gorgeous display of red Lilies, eye-catching Germini daisies, white Bacardi Chrysanthemums, festive red berries and red Spray Carnations. This delightful bouquet is expertly finished with decorative woven bronze balls and is sent to your loved one in bud for maximum vase life at home. This Christmas Bouquet also comes with chocolate Santas. 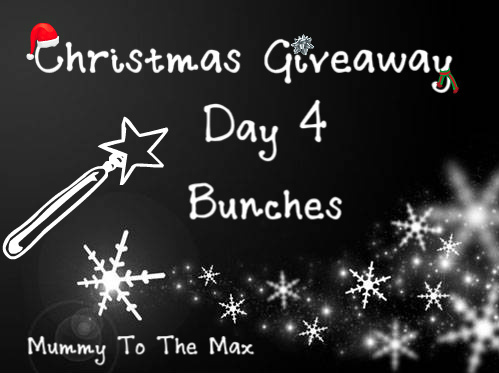 To win this mega prize from Bunches enter using the Rafflecopter Form below and remember its only open for 3 days. There are 2 bouquets up for grabs! Good Luck all! lovely flowers id give them to my grandma she would love them! would love to treat myself to these - gorgeous! They look gorgeous I would love to receive this as gift and I would so love to win for my nan who loves her flowers bless her. These flowers are so beautiful and unusual. fabulous advent comp, thank you. Aw what lovely flowers - so festive! Thanks for the competition, its lovely and a rare treat to have flowers in the house! Beautiful bouquet, I love flowers. Another fab prize! Good luck to everyone! Gorgeous, I can't afford big presents this year....my mum would absolutely love these! Got all the family coming to mine this Christmas, would be lovely to have these on my table - Gorgeous!! This woulds be fabulous for Xmas my grandkids would love me even MORE!!! !